Shouldn't he be wearing a poulet-proof vest? "Sorry mate, I prefer my chicken roasted rather than poached." Things went horribly wrong with the stripper at the hen do. Marvin had no choice but to lower his gun, drop down onto his good knee and swear an oath of allegiance to his chicken overlords. There is nothing worse than a man showing his breasts off-Put them away son. Would've done better with a shirt, tie and Blaser. Bargain Hunter bags two for one offer. "It's a new ad for Bernard Matthews, they started shooting yesterday"
Mark had to settle for the second breast prize. The ultimate genetically engineered gamebirds. Tim was well pleased that he'd caught his first thief on his first day, but after the ambulance had gone, he was immediately sacked as a Tesco instore security guard. 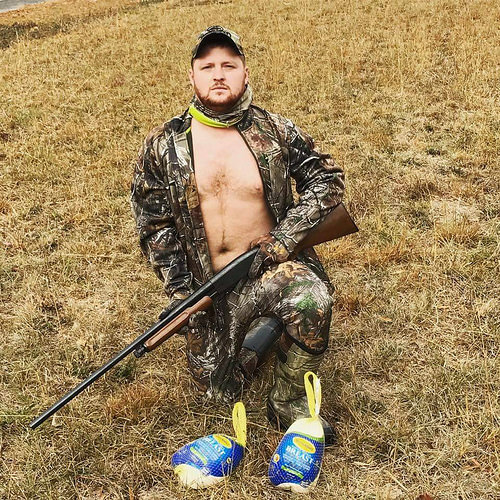 It's not a good idea going hunting with a pair frozen breasts. Next time wear a thermal vest you nugget. Walter Palmer the Dentist gets a brace. Too cowardly to shoot free range turkey. America's worst armed robber shows off his latest haul. *Ahem* "Here's two I caught earlier"
Wanted - one khaki T-shirt, size XL. Will swap two frozen chickens.